How to fit a letter box in wooden doors or PVCu doors. 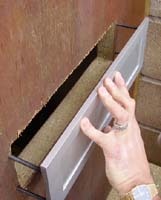 Step-by-step instructions with pictures on fitting a letterbox. Video Tutorial on fitting a letterbox into a timber door. In this project we show you all you need to know about fitting a letterbox including how to mark out and cut a hole in your door for your letterbox, how to check the hole is the right size, how to make sure your letterbox is level and how to mark the holes that need drilling for the letterbox fixing studs. Fitting a letter box is not the easiest of DIY tasks but approached with care it can be done in both wooden doors and PVCu doors alike. The biggest problem with fitting a letter box is the fear you face when cutting a huge hole in your door! Remember Diydoctor’s tip, measure twice, cut once, follow our instructions for fitting a letter box and you wont go far wrong. If you have not yet selected your new letter box or are looking to purchase a new door, there are many differing styles and finishes available, and some of these can be seen in your local DIY store. As you can see from the below images we are fitting an industrial office letter box for the purposes of this how to tutorial as this makes it a little easier to see how it’s fitted, but on the whole, the principles are the same regardless of the door and letterbox style or type. 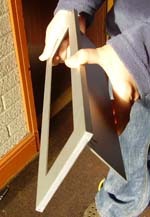 Jigsaw with blade for cutting chosen door material e.g. timber blade or PVCu blade etc…. This box opens inwards so the flap pushes into the hole you will need to cut in the door, making it even more important to cut the hole accurately. Mark the hole a couple of mm larger than the opening required to push the flap into. Use a spirit level to get the letter box absolutely level. Drill 4 holes large enough to get a jig saw blade into. The edge of the holes should be touching both lines near each corner. Make sure you keep the drill level in your hand. Use a jigsaw very carefully to cut along the lines you have marked. Don’t hurry, let the saw do the work and don’t push it too hard. Cut the hole inside the lines and when you have pushed the middle out use a wood rasp to tidy up the hole. Cutting straight lines with a jigsaw is just about the hardest thing to do in woodwork so take your time! Screw in the threaded studs provided with the kit to the back of the plate. Once you have cut your hole and tidied up the edges with a rasp, place the letter plate with the studs in place to make sure that the hole is big enough and everything lines up correctly. Using a mallet or a hammer with some cloth over the face to avoid damaging the letter plate, tap the plate at each corner where the studs are. 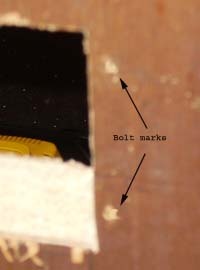 This will make a small mark in the door to enable you to accurately drill the holes for the studs to go through. Drill the holes for the studs and then push each stud through until the letter plate is right up against the face of the door. Tighten the correct size nuts and cut off any excess thread with a hack saw. Easy wasn’t it!? If you would like further information on using a jigsaw why not go to our video section on using a jig saw to watch a film on how to use this useful power tool correctly. Can I Install A Letter Box Into A Hollow Door?